The ROBO-678W-2 all-in-one single board computer is designed to fit a high performance Celeron/Pentium-III based CPU and compatible for high-end computer system with PCI Local Bus architecture. It is made to meet today’s demanding pace, and keep complete compatibility with hardware and software designed for the IBM PC/AT. It's beneficial to build up a high performance system for VARs, or system integrators. 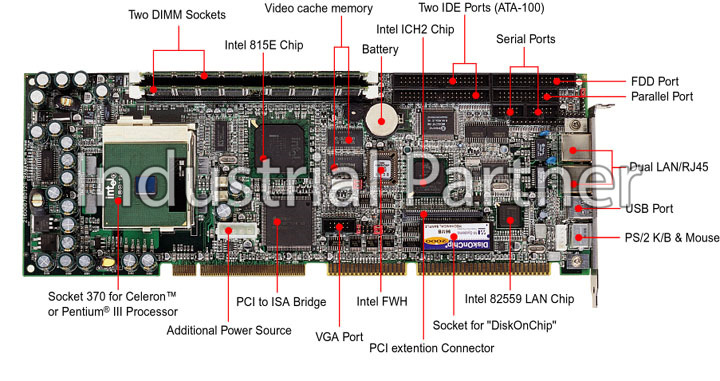 The on-board 3D Graphics display, and fast Ethernet interface will bring full functionality and high performance to all segments of the PC market.This single board computer runs with Intel Celeron/Pentium-III (PPGA370 or FC-PGA370) processor, and support DIMM up to 512 MB SDRAM.